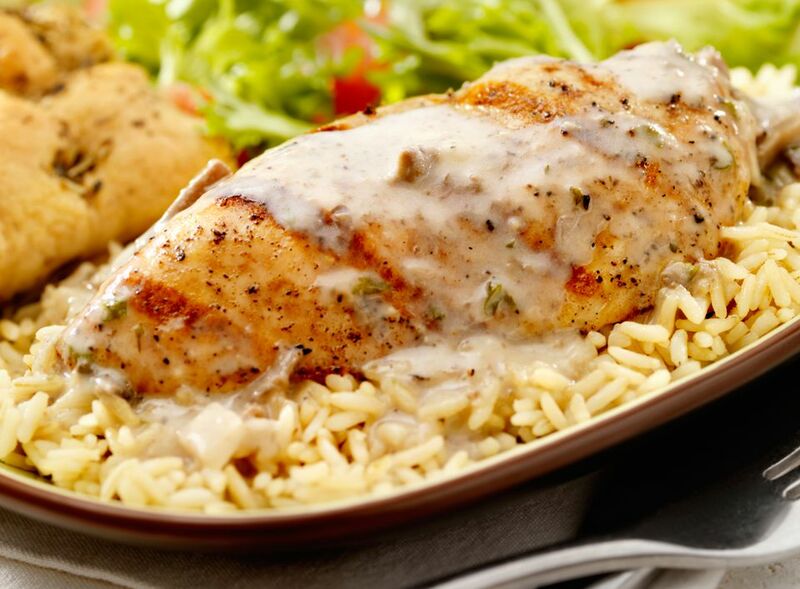 This chicken and rice bake is a snap to make with Italian dressing mix and condensed soup. This casserole is an easy, popular recipe for chicken breasts. The easy preparation leaves you free to do other things while the chicken bakes. Butter a 9-by-13-by-2-inch baking pan or a 2 1/2 to 3-quart casserole. Wash and drain the rice. Spread in the prepared baking dish. Mix soup, Italian dressing mix, and broth. Stir the soup mixture into the rice. Place the chicken on the rice mixture (skin side up) and season with salt and pepper. Cover the baking dish tightly with foil and cook for 1 hour. Uncover and cook for 20 minutes longer; until most of the liquid is absorbed and rice is tender. The minimum safe temperature for chicken is 165 F.
If desired, put the casserole under the broiler for a few seconds to brown chicken.